Provides cavity protection and under-sealing for blank, corroded and painted surfaces. This is the only product (according to independent tests) that provides long term seam penetration and also protects better than its competitors. It is suited to all types of vehicles, vintage and classic, new and used vehicles of all ages. It does not have to be applied by a garage, it can be applied by a ‘do-it-yourself’ enthusiast with the right equipment. This is 100% product i.e. it contains no solvents nd therefore no lasting odours in the vehicle and making it safe for the occupants. 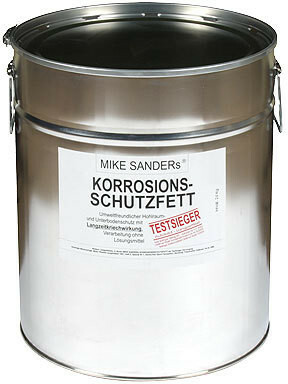 Mike Sanders Anti-corrosion-grease has been tested by several independant German car magazines. It is the best rust prevention grease on the market.